The 2016 Major League Baseball (MLB) season got underway on 3rd April. This year, 30 of the best teams in the US will be competing for league glory up until 2nd October. As is tradition, the 2016 MLB season will offer up 162 matches – 162 opportunities for you to take on the oddsmakers in a battle of foresight and logic. According to the stats, Las Vegas bookmakers accepted just over $897 million (£628 million) in MLB bets in 2015; when the books were closed, the casinos kept just 4.39% of the money staked. In comparison to other American sports, such as American football and basketball, this ‘win’ ratio is markedly lower, suggesting that baseball betting is indeed a lucrative proposition – if you can pick out the best bets. Indeed, the combination of 162 games, a generous (potential) win rate and a plethora of betting bonuses throughout the season make MLB a hot prospect for any sports fan. Here's a look at some of the best MLB bets you can have a flutter on this season. When it comes to the hot prospects for MLB glory this season, the oddsmakers are currently having a hard time looking beyond the Chicago Cubs. Even before the team's first outing against the Los Angeles Angels (on 5th April), the Cubs have been pitched at 6/1 for World Series success by Bet365 Sports. In fact, it's a similar story over at Paddy Power Sports and William Hill Sports, with both bookmakers offering a price of 8/1 on the Cubs. If the team's manager Joe Maddon is to be believed, those odds represent fantastic value. Addressing the media at the start of April, Maddon stated that he trusts his young team and believes they can handle the “pressure and expectations” that will inevitably bear down on them throughout the season. 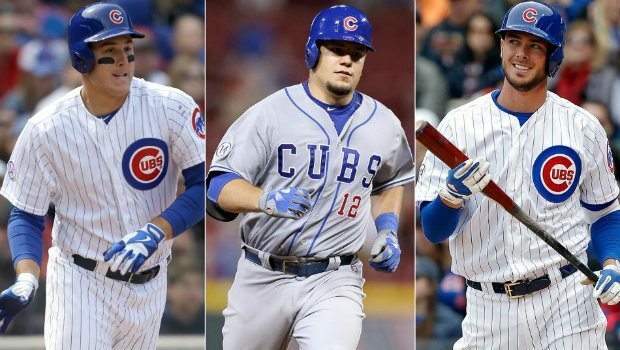 ESPN writer Jesse Rogers believes this could be the Cubs' year thanks to a young line-up he feels is “one of the best” in the game. Following this line-up of emerging talent, you can currently find odds of 6/1 on the Cubs' Jake Arrieta winning the 2016 NL CY Young Player Award at Paddy Power Sports. Of course, if speculating on young talent isn't your thing, you can also pick up odds of 7/4 on Mike Trout or 11/2 on Josh Donaldson becoming the 2016 MLB Most Valuable Player (MVP) over at Paddy Power's world class bookmaker. If you're after some MLB bets with slightly more variance but a lot more potential, then Paddy Power Sports' homerun roster is worth a look. Currently topping the list of hard hitting prospects is Giancarlo Stanton, a top 10 MVP candidate for the Miami Marlins. Last season Chris Davis notched up 47 homeruns (you can get odds of 7/1 on him being the leading run scorer this season); however, thanks to a tally of 47 runs, Stanton looks to be the best batting prospect in 2016, despite being injured for a large part of last year. But if the Miami Marlins' star player can't stay injury-free this season, he may not take the golden bat, which would mean the likes of Davis, Mike Trout (10/1) and Bryce Harper (12/1) all suddenly become intriguing value bets. Whichever market you enter and wherever your allegiances lie, the 2016 MLB season looks to be filled with potential. From outrights and in-game wagers to individual markets, Paddy Power Sports has everything you need to make the 2016 MLB season one to remember.